Eight-year-old Violet loves playing Minecraft. Her twin brother Theo is more into Digimon Links. Their mum Jane sometimes worries about the sheer volume of screen time these games consume. But she’s done her homework. She knows games like these are creative - maybe even educational - and definitely non-violent. That’s a huge relief. But there’s something Jane has never considered. Could it be that innocent kids’ games like these may be grooming Violet and Theo for a future as online gamblers? Believe it or not, that’s exactly what new research is suggesting, as the line between online gaming and online gambling becomes increasingly blurred. In Australia right now, teen gambling is already “rife,” according to The Gambling Treatment Clinic in the University of Sydney’s Brain and Mind Centre, with more than one in five participating. But it’s not just teenagers. Even kids as young as three may be at risk. “Gambling sites masquerading as games” are one reason why, the research shows. But so too are mainstream children’s games that subtly embed elements of gambling, especially those that require in-app purchases to “win” (think The Sims, Grand Theft Auto, and the enormously lucrative Candy Crush franchise). Other embedded features are the opposite of subtle. Minecraft now supports a host of gambling plug-ins that allow users to build slot machines, roulette tables and entire casinos. It has also introduced its own virtual currency, Minecraft Coins, which users pay for in real money. One recent study of over 100 adolescents and young adults found that gamers were more likely to gamble, and both social and problem gamblers were more likely to be gamers. Why? Experts point to clear psychological and behavioural parallels between the two types of activity. In a nutshell, both use exactly the same “hooks” to keep kids online. Both work on the principle of what psychologists call variable reinforcement schedules - pay-offs, in layman’s terms - to reward and prolong play. Both use stimulating sound and light effects within game play. Both give users the illusion of skill (even when winning is largely or even completely a matter of chance). And perhaps most critically of all, both online gaming and online gambling encourage users to join a social network - a community that supports deeper commitment to play through chat and messaging. Then there are the social casino games that may or may not directly market to children but reach them all the same. Games like Slotomania, Texas Holdem Poker and Heart of Vegas will generate a revenue jackpot of around AU$5.75 billion this year. Most such games operate outside of stringent Australian regulations. And of course unlike a real casino, proof of age is not required to play. Nor is actual money. “Freemium” sites offer play-for-free options as a way of priming young users. Harmless fun today - problem behaviour later? “These apps are flying under the radar of regulators and parents and are nurturing a generation of problem gamblers and skewing expectations to easy money,” observes Jordan Foster, clinical psychologist at ySafe Solutions and cyber expert with Family Zone. Fellow Family Zone cyber expert Dr. Kristy Goodwin agrees. “The neuroscience is very clear. Most games are designed to utilise the same reward pathways - and the resulting payoff in terms of dopamine hits - as casino-style gambling. 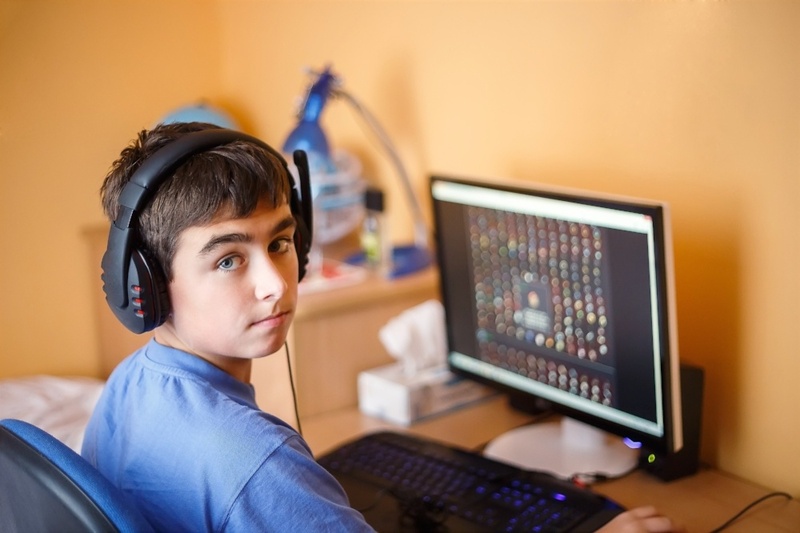 Managing online gaming and cyber safety in general can be a difficult journey for parents. But that’s where Family Zone and our team of Cyber Experts, including Jordan and Kristy, come in. We’re here to help parents protect their family from online risks such as gambling, grooming, excessive social media and inappropriate content.